Khartoum recently hosted Wagdy Ghoneim, a leading member of the Egyptian Muslim Brotherhood, at the invitation of the General Sudanese Students Union to meet with Secretary-General of the Popular Congress Party Hassan al-Turabi, Secretary-General of the ruling Islamic movement Al-Zubair Ahmed al-Hassan and Islamic leader Ibrahim Ahmed Omar. The invitation of Ghoneim and its announcement by government platforms in Khartoum indicate a dangerous escalation in Cairo’s ties with the government of the National Congress Party. The visit has sparked controversy in Cairo and Khartoum alike. Media circles in Egypt considered it a negative sign and an escalation on the part of Khartoum. The visit has also strengthened many doubts about the presence of a number of Egyptian Brotherhood leaders in Khartoum. 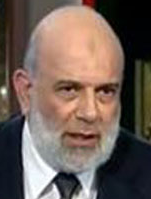 Some said that Ghoneim is planning terrorist attacks against Egypt from Sudan. The GMBDW reported in September 2013 that Wagdy Ghoneim was among fourteen defendants charged by Egyptian authorities in connection with clashes that took place in December 2012 in front of Al-Itihidaya presidential palace in Cairo. See our profile on Mr. Ghoneim for a catalog of his extremist statements. When we last reported on Hassan Turabi in November 2012, he had just endorsed US President Obama for re-election. A post from 2011 reported that Mohammed Badie, the head of the Egyptian Muslim Brotherhood, had held a meeting in Cairo with members of Hassan Turabi’s Popular Congress party ahead of visit to Sudan where Dr. Badie was expected to meet with Turabi himself. Hassan Turabi was involved in the past as a leader in the Sudanese Muslim Brotherhood and is probably best known as the man who invited Osama bin Laden to live in Khartoum during the 1990s when Sudan was both a center for terrorist activity and strongly under the influence of Turabi. The BBC has published a profile of Turabi which can be found here.